TurnKey Kiosks LLC announces that it has been selected by Robocoin to manufacture the world’s leading Bitcoin ATM Kiosks. The biometrically enabled kiosks let customers instantly buy, sell or transfer Bitcoins. What started with the world’s first Bitcoin ATM in Vancouver, Canada, Robocoins have now been deployed to 19 countries with 12 unique currencies and growing. From Coffee shops to Casinos, the Robocoin platform started the Bitcoin ATM industry and has remained the market leader. Robocoin CEO Jordan Kelley remarked, “We have selected TurnKey as our Hardware partner because of their knowledge in the kiosk technology space, their flexibility, and their total commitment to our project”. The company has established market leadership in the areas of Anti-Money Laundering and Know Your Customer compliance, as well as customer protection and user experience. 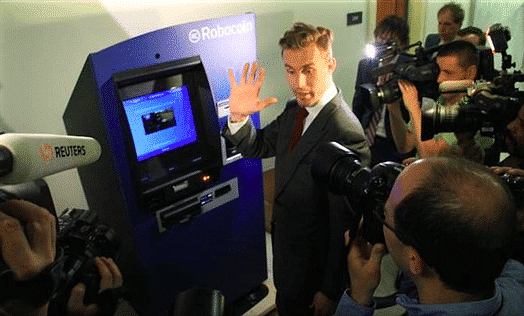 Apart from being the first Bitcoin ATM in the world, Robocoin has also gained worldwide press for being the first Bitcoin ATM in the U.S., presenting for the U.S. Congress, and integrating software to target global banking and remittance markets. Robocoin has been featured in the Wall Street Journal, TIME, Forbes, The New York Times, NBC, and USA Today among others. The Robocoin Kiosk comes in three models. 1) Robocoin Classic ($15,000) 2) Robocoin Recycler ($20,000) 3) Robocoin Recycler Max ($35,000), all available at Robocoin.com. TurnKey Kiosks, www.turnkeykiosks.com is a custom kiosk manufacturer specializing in biometrically enabled transactional kiosks. Gary Strachan, Director of Operations for TurnKey Kiosks said “Turnkey is very proud and honored to have our kiosk selected by Robocoin. We worked very closely with the Robocoin Team to deliver a kiosk that enabled fast and secure Bitcoin transactions. It was also a challenge to launch with a world wide deployment, but we were happy to do so.” Turnkey continues their close relationship with Robocoin to keep on the forefront of technology required for Bitcoin transactions.